By Graig Graziosi | February 18, 2018 at 12:01a.m. Mary Sullivan said goodbye to her family for the last time on a bridge in Bennekerry, Ireland. She had to leave; her newborn daughter was taken from her by the Catholic Church and sold to a family in the United States. Heartbroken, she found no peace in the familiar sights of her home. So she said goodbye and left for London, disappearing into the streets of “The Old Smoke” in 1956. At the same time on the other side of the Atlantic Ocean, Mary’s daughter, Kathleen, was settling into her new home in Youngstown, Ohio. Kathleen was sold for $10,000 to a family in Ohio who wanted to adopt an Irish child from a Catholic family. She arrived in New York City on an Aer Lingus flight from Dublin with 10 other children, all intended for “adoption” by American parents. Though life in the U.S. would prove hard and, for many years, loveless, Kathleen’s theft was a cruel mercy compared with the fate she escaped in Ireland. 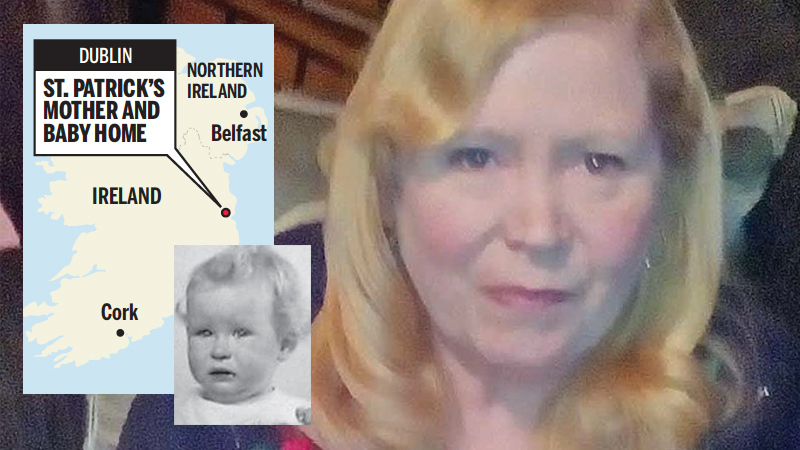 Kathleen was born in St. Patrick’s Mother and Baby Home in Dublin, Ireland. Mother and baby homes were built by the Catholic Church to house unwed mothers and their children. Once the women gave birth to their children, the nuns who ran the home would separate the mother and child, and enter the women into a year of unpaid labor as payment for the nuns’ midwife services. The children were often given up for adoption without the mother’s consent, or, in the case of Kathleen, sold to another country. In 1952 the Irish government passed the Adoption Act, which set rules for the legal adoption of children, including the need for maternal consent before a child can be put up for adoption. In his book “Banished Babies,” journalist Mike Milotte estimated approximately 4,000 “banished babies” are believed to have been illegally adopted from Ireland, including those from mother and baby homes. Mary first entered the home after becoming pregnant outside of marriage in 1953; she gave birth to Kathleen in 1954. For Kathleen, escaping the mother and baby home meant escaping a life of societal shaming, isolation and forced labor. Unfortunately for her, while the material elements of her life improved significantly in America, she was still a victim of isolation. Kathleen Sullivan — who now lives on the West Side — still remembers the day she found out she was adopted. Kathleen grew up believing that her birth mother had abandoned her, and felt unwelcome and unwanted by her new family in Youngstown. She longed for a home she didn’t know and a family she assumed didn’t exist and, being painfully shy, rarely left the family’s home in Brownlee Woods. In public, her father would introduce her as his “adopted daughter” — a demoralizing experience for her each time it happened — and before the end of his life he confirmed one of her long-held suspicions. In the final year of his life, Kathleen asked her adopted father, bound to his bed where he would eventually die, whether or not he ever really wanted her. “No, I didn’t,” he said. Though her life was filled with hurdles, Kathleen eventually graduated from Cardinal Mooney High School, married, and had two children, Dennis and Kevin McKenney. Starting a family of her own was the beginning of a long process of learning how to feel loved again. But it also resulted in Kathleen getting to the bottom of some of the questions that had haunted her throughout her life. Kathleen’s oldest son, Dennis, became aware of his mother’s painful upbringing early in his life, and as he grew the reality of what his mother endured inspired him to begin searching for clues to her true heritage. McKenney spent time gathering documents and researching the mother and baby homes, and eventually learned of the services of Clodagh Malone. Malone volunteers as a search angel — an individual who helps adopted children locate their birth families and vice versa — and is based in Ireland. Like Kathleen’s mother, Malone was a survivor of the St. Patrick mother and baby home, and when McKenney informed her of Kathleen’s case, she agreed to help. By happenstance, Malone had recently met a Magdalene Laundry survivor named Maureen Sullivan, who also happened to be from Carlow, and who would have been alive when Kathleen’s mother lived in the city. Though not sisters, DNA testing confirmed that the women were first cousins. Kathleen’s last name was changed by the nuns early on in an attempt to make finding her through official records more difficult. Maureen also revealed that she had memories of Kathleen’s mother before she left for London. Speaking on the phone, she told Kathleen the story of Mary, revealing that she wasn’t abandoned after all but was taken from her mother and sold. McKenney was thrilled to help his mother find members of her birth family, but neither he nor Kathleen are ready to give up the search for her true identity. Thanks to Maureen, Kathleen learned she has five siblings. With the help of her son and her cousin, Kathleen hopes to eventually reconnect with her siblings and learn more about her mother. While that search may take some time, the family does have more immediate plans for a physical reunion in the near future. The family will be raising money on the website Kickstarter for a trip to Ireland later this year to Carlow to meet Malone and Maureen. McKenney hopes to take the trip early this fall. Maureen is looking forward to meeting her cousin; she plans on taking Kathleen to her family home and giving her a tour of the town. Though there will be much to see, Maureen said the women’s first stop will be a bridge in the town of Bennekerry, where Mary left her family for the last time. This time hearts won’t be broken, and there will be no goodbyes. July 4, 2015 6:18 p.m.
February 13, 2010 9:20 a.m.